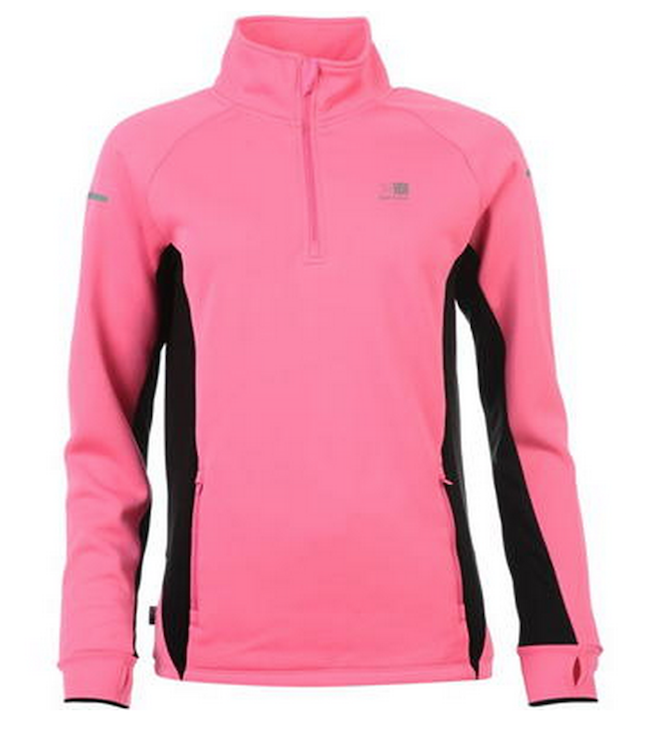 This pink half-zip fleece from Karrimor has no pretensions to be cycling gear, but is actually designed for runners. However, of all the Karrimor products I ordered in the firm’s end-of-line cheap as chips sale, this is my favourite. It’s a pretty colour, really quite high-vis, with a softshell-type smooth outer surface and a lovely soft inside surface, thumbholes, reflective details, zipped pockets and nicely slimming black side panels. The cut is also very generous – this feels more like a 16 than a 14. Do I expect perfection? Well, not for £15, which is what I paid for it, reduced from around £43, but I could hardly be more pleased. In fact, I like it so much I would happily wear it round the house and am thinking of buying the same again in the reverse colourway. Sadly, I was too late to get it in the high-vis yellow. On the bike, this fleece offers a nice degree of windproofing and is easily long enough at the back to cope with my riding position (about 70 degrees). It has no back pockets, obviously – not being a cycling jacket – but because I ride fairly upright, the side pockets are within easy reach, and they zip, which is crucial for my keys (which I carry on me for removal of my battery, etc). The raglan sleeve head makes for complete freedom of movement and there’s a zip garage to stop the front zip from digging into your chin. And finally the thumbholes are useful to tuck the cuff into your cycling gloves and prevent wind chill. Overall, I am extremely pleased with this fleece and for the money, I don’t think it can be beaten. Karrimor may have lost its reputation with regard to its rucksacks etc but if this item is anything to go by, its clothing is still worth a punt.